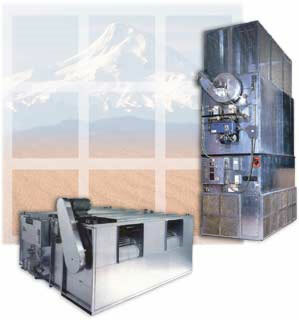 Applied Air climate control systems are designed to satisfy the needs of both the owner and the specifying engineer. Standard models are available in 150 different sizes and arrangements, from 1,600 to 150,000 CFM. The gas-fired burners have capacities up to 14,086,000 BTUH. Whether units are located indoors or outdoors, mounted on the floor, roof, grade, or suspended, and fueled with natural gas or propane, Applied Air has been satisfying the need since 1975. All standard units include the necessary controls to provide years of trouble-free, low maintenance operation. Component parts are of the highest quality. Safety devices, meeting national and local standards, ensure fail safe protection in every Applied Air unit. All Applied Air units are built with U.L. approved components, where applicable. Optional gas controls can be furnished to comply with FM & IRI. compliance allows the owner to meet insurance underwriter's requirements and assures the customer of equipment reliability and conformance to recognized standards.